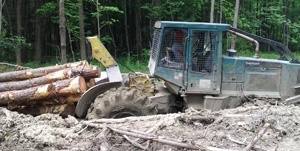 Hess Farm Tire, LLC in Andover, NY, has been providing a large selection of quality forestry, construction, and farm tires to Andover and the surrounding area since 1969. As a family-owned and operated business passed down through three generations, our fast, reliable, and dependable service is what has kept us in business for so long. We carry Rim Guard Tire Ballasts which is non-toxic and biodegradable. We will come to your construction site or farm to repair and replace your tires. We carry all major brands of tires, including Firestone, BKT, Titan, Goodyear, and Michelin. We are certified Firestone and Michelin AG dealers. Our tires are ideal for owners of heavy-duty vehicles, farmers, construction workers, and loggers. Our fully-insured company services all of Andover and surrounding areas, western New York, and northern Pennsylvania. Give us a call now for a free estimate on all your tire needs! Forestry And Construction Tires – We carry a large selection of forestry tires and construction tires from the top brands in the industry. Rim Guard Tires Ballast – The best liquid tire ballast available. Farm Tires – Variety of farm tires from the top brands in the industry. © 2019, Hess Farm Tire, LLC. All Rights Reserved.